Five plastic candy hearts (""Puppy love""; ""You send me""; etc.) 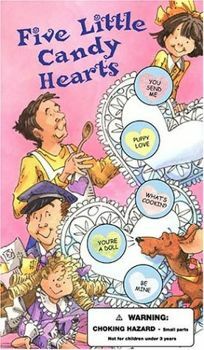 shine through the die-cut pages of Five Little Candy Hearts by William Boniface, illus. by Lynn Adams, told in singsong rhyme. As with earlier books in the series, the quintet of hearts counts down with a flip of the page, to a pop-up surprise at the end.